A firm hoping to build a Jewish kosher abattoir near a school, slaughtering about 600 birds an hour, has said people have "nothing to worry about". Concerns about noise and traffic have been raised by those living and working near Finway Industrial Estate, Luton. One woman who works near the site said she would leave her job because she did not want to hear "screaming animals". 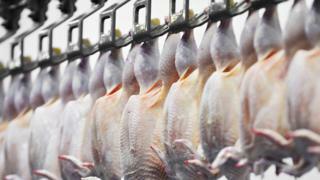 Kosher Deli Ltd, the company involved, said it would only handle poultry and there would be "no screaming". Luton Borough Council has received a number of comments about possible extra traffic at the site, with one person concerned about animals "making horrendous noises for children to hear". One woman told the BBC: "I really am shaking and I'm dead against abattoirs anyway, let alone having one opposite where I work, and there's a school at the end of the road. "There'll be screaming animals all day. It'll be dreadful and disgusting and I will definitely leave my job if this goes ahead, there is no doubt about that." A spokesman for the company said there was "nothing to worry about". "There'll be no screaming animals as it's not a cattle or lamb slaughterhouse - it's a poultry abattoir," he said. "It's a building within a building and it will be noise-proof and we had a report done which said there'd be less traffic there than the cash and carry that was there before us." The decision on the application will be made by Luton Borough Council but the date is not yet known. Kosher food complies with Jewish dietary law and the method of animal slaughter for meat requires the neck of an animal to be cut with a sharp knife by a specially-trained slaughterer. Judaism forbids the use of stunning, where animals are made immobile or unconscious, immediately before slaughter. Should religious slaughter be banned in the UK?